So after leaving the Islands, I got the boat to Belize City. This is not a place for tourists and I didn't want to spend any time there, so I got straight off the boat and onto a bus headed for Guatemala. The drive through Belize City was bleak, it's very run down and ramshackle looking (is that a word or did I just make that up???). Later we passed through some rural villages and the bus ride was seriously insane. The infrastructure just isn't there yet. After 8 hours and one border crossing later, we had reached our destination of Flores, Guatemala. Founded by the Itzaes people after being expelled from Chichen Itza, Mexico (see earlier blog) sometime around the 14th century, Flores is a sleepy, peaceful island village located right in the middle of Lake Petén Itza in the remote north-eastern jungle region of Guatemala. Almost everyone who plans to visit the Tikal archaeological site stays in Flores or the neighbouring village of Santa Elena. Both of which have their own special charm. In Flores you can walk everywhere, as the island is small enough. If you are heading over to Santa Elena you can walk or hop in a tuk-tuk, there are literally hundreds of them everywhere. There isn't much to do in either towns, but they are nice stop gaps between destinations. 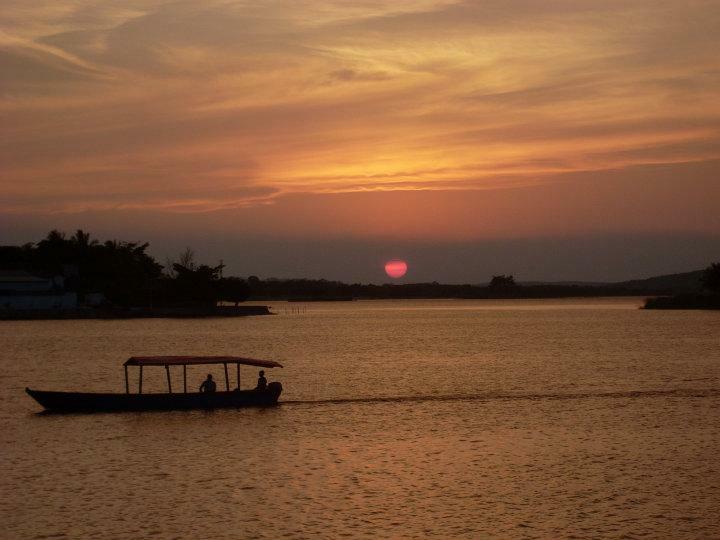 Flores especially, has beautiful scenery as it sits in the middle of Lake Petén. There are docks all along the water for swimming and although I didn't go in (it did not look clean enough for me! ), I have been told the water is very warm. In Flores I stayed at the Los Amigos Hostel. Everyone had raved about how cool this hostel was, but it turned out to be a dirty, hippy's paradise and I just wasn't very impressed with it. There is a big courtyard in the middle of it, so you are always half inside and half outside, which brings with it an alarming amount of wildlife. Within 30 minutes of being there I had seen lizards, birds, parrots, a turtle, 2 cats, a very smelly dog, a variety of annoying insects and one of the workers had found a snake skin that had been recently shed (Ewwww!). I spent the next few days looking for snakes everywhere, just in case! On my first night there I met Charlie from London. He was super sweet and almost at the end of his travels. We had a few drinks in the bar that night, well I did anyways. I awoke the next day with a killer hangover and to find that Charlie had left me his lonely planet guide to Central America (AKA the traveller's bible!). It looks as though it has been in the wars, but now that I have it, I don't know how I ever survived without it. Charlie had been given it from a fellow traveller and promised to pass it on when he was done with it, so I promised to do the same. So some lucky stranger will receive the dirtiest, most mangled, stained and written all over book ever, what a prize! I had planned to go kayaking on the lake that day, but the rum from the night before was killing me and I couldn't really be arsed anymore. Plus, the heat inside Los Amigos was making me feel worse, so I went back to bed for a bit and just lazed about most of the day. The next day was my trip to Tikal. I didn't do much else in Flores, except walk around the island, have a look through the market in Santa Elena and stare out at Lake Petén. Besides Tikal, I basically just relaxed, read a bit, had a few drinks and ate some good food. That was the one good thing about Los Amigos, they had pretty good grub (for Guatemala anyways). Also, I met a really nice French girl, who arrived on my last day there. We shall call her Isabelle for the sake of the blog, as I can't remember what her name is. Actually, that may be a lie because I don't think I ever knew her name to begin with. Oh well, she looked like an Isabelle, so that's her new name! After Flores I headed back onto yet another shuttle van for another 8 hour journey to my next destination Lanquin, Guatemala (AKA the best place I have been so far! ).